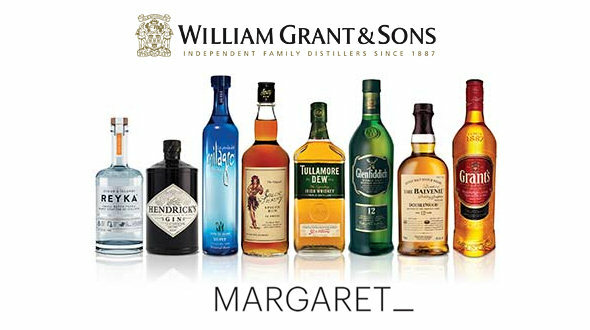 London based creative agency Margaret has strengthened its food and drink division with a new account win for the retained Global PR for the William Grant & Sons Innovation portfolio. Margaret will be responsible for helping to develop outstanding creative ideas that will build the portfolio in global markets. The brands include Reyka vodka, Solerno liqueur, Hudson whiskey, Milagro tequila and new whisky portfolio including Girvan Patent Still, Gordon Highlanders, Kininvie and Rare Cask reserves. The account, which was won in a three-way pitch, will be headed-up by Agency Director Olly Dixon and PR Director Lucy Stanfield. Damien Heary, Planning & Innovation Director at William Grant & Sons commented, "Fundamental to any new innovation from William Grant & Sons is combining incredible liquids with ideas that are exciting, compelling & highly different. Margaret was set-up by three friends Katy Louis (Ex Dazed & Confused), Emma Pettit (Ex Institute of Contemporary Arts) and Olly Dixon (Ex music promoter and producer). Now in its 7th year, it is based in London Fields, Hackney and covers creative campaigns for PR, marketing, events and social media for brands, venues, film distributors and festivals, music events, contemporary arts and photography and cultural institutions.